There’s also a super-size confetti courtyard. We have big news, Scandinavian design lovers: Stockholm-based design studio and online retailer, Hem, has opened its first-ever U.S. outpost. Los Angelenos will be the first to get a real-life taste of the brand’s contemporary and colorful designs at its brand-new downtown showroom, which officially opened its doors today. If you aren’t already a devout Hem fan, let us introduce you. Swedish for “home,” Hem was founded in 2014 with the intent to deliver Nordic soul through top-quality furniture, lighting, and home accessories. Since then, the startup has collaborated with leading global designers like Max Lamb, Pauline Deltour, Luca Nichetto, and Philippe Malouin for special collections and products. Hem first tested the U.S. waters with a pop-up shop in NYC a little over a year ago. We’re secretly crossing our fingers the brand’s second permanent outpost will give New Yorkers a chance to shop and experience its pieces IRL. While Hem is often compared to Everlane and Warby Parker for its Millennial-friendly, direct-to-consumer approach, think of the Swedish retailer as an high-design alternative to Ikea. What’s more is that you won’t need a never-ending pathway of arrows to guide you through Hem’s showroom. To celebrate its West Coast HQ, the brand has teamed up with San Francisco–based designer Clark Thenhaus, founder and director of Endemic Architecture, for a confetti-inspired courtyard installation. According to the company, the super-size confetti graphics wrap the walls and floors to create a “kinetic layering” of landscape, furniture, and architecture. The vivid backdrop will serve as a celebration of Hem’s now-iconic lineup of products. Here are a few must-buys to keep an eye out for when you stop by its brand-new outpost. Drawing on both Italian and Nordic mid-century design, Luca Nichetto’s dreamy accent chair and ottoman for Hem puts a slender twist on a classic silhouette with a contemporary range of color choices. The living room staple can be assembled in a flash—no tools required. 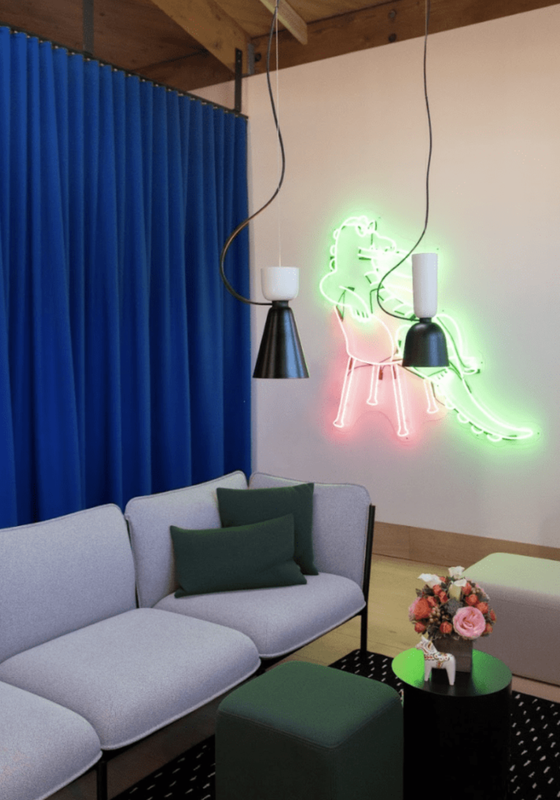 For an alternative to Ikea’s Sinnerlig Pendant, Nichetto’s Alphabeta lamps’ put a bold spin on traditional ceiling lighting with flamboyant shapes and color-blocked compositions. With eight different forms and four hues to choose from, the possible combinations (there are 1,024, to be exact) are practically endless. Crafted from high-quality oak, the screwless Zig Zag Shelf is one of our all-time favorite storage finds. For the modern bibliophile who doesn’t own a toolbox, this flat-pack unit is a gift from the bookshelf gods. The Hem showroom is located at 810 Mateo Street in Downtown Los Angeles.